The Bugatti Chiron is a mid-engined, two-seated sports car, designed and developed by the Volkswagen Group as the successor to the Bugatti Veyron. The Chiron was first revealed at the Geneva Motor Show on March 1st, 2016. The main carryover piece will be the 8 litre W16 quad-turbocharged engine, though it is heavily updated. Direct injection will be added and two of the four turbos will be electronically driven to eliminate turbo lag. Chiron has 1,103 kW (1,479 bhp) of power and 1,600 N·m (1,180 lb·ft) of torque starting from 2000 rpm. Like its predecessor Veyron, it has a carbon fibre body structure, independent suspension and 4WD system. The Chiron will accelerate from 0–100 km/h (62 mph) in less than 2.5 seconds, 0-200 km/h (124 mph) in under 6.5 seconds and 0-300 km/h (186 mph) in under 13.6 seconds. The Chiron's top speed is electronically limited to 420 km/h (261 mph) for safety reasons. The anticipated full top speed of the Bugatti Chiron is believed to be around 463 km/h (288 mph). At full speed the 100 liter fuel tank would be empty in 8 minutes, that is 190 l/100 km or 4.5 kg CO2/km. 500 units are to be produced and 170 orders have already been placed. The Chiron will be available towards the end of 2016 with a cost of €2.4 million (circa £1.9 million, or $2.66 million US). The Agera R made its debut at the March 2011 Geneva Motor Show. It can accelerate from 0–100 km/h (0–62 mph) in 2.8 seconds and reach a theoretical top speed of 439 km/h (273 mph). The Agera R has a drag coefficient of Cd=0.37, or Cd=0.33 at high speed due to its adaptive rear wing.This adaptive rear wing system is lighter than conventional hydraulic/electrical adaptive systems, and has the unique ability to compensate for head/tailwind due to its spring-loaded design. On 2 September 2011, during test sessions in Ängelholm, the Agera R broke six world land speed records for a production car, including 0–300 km/h (0–186 mph) in 14.53 seconds, and 0-300-0 km/h in only 21.19 seconds. The braking performance required to maintain this record is enabled in part by the Agera's stability, demonstrated by Koenigsegg's test driver and drivetrain technician Robert Serwanski. The 2013 version of Agera R premiered at the 2012 Geneva Motor Show. Upgrades included carbon fiber wheels, enhanced aerodynamics, and engine upgrades allowing the Agera R's 5 litre twin turbocharged engine to produce 850 kW (1,140 hp) on E85. And, thanks to Koenigsegg's Flex Fuel Sensor technology, the ECU can respond to varying fuel qualities and alcohol content by reducing power levels as a means of protecting the engine. On standard low octane fuels, power is reduced to 716 kW (960 hp). 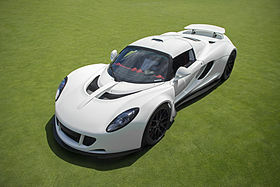 The Hennessey Venom GT is an American sports car based on a heavily modified Lotus Exige chassis, manufactured by Texas-based Hennessey Performance Engineering. On January 21, 2013, the Venom GT set a Guinness World Record for the fastest production car from 0–300 kilometres per hour (0–186 mph) with an average acceleration time of 13.63 seconds. In addition, the car set an unofficial record for 0–200 mph (0–322 km/h) acceleration at 14.51 seconds, beating the Koenigsegg Agera R's time of 17.68 seconds, making it the unofficial fastest accelerating production car in the world. On April 3, 2013, the Hennessy Venom GT crested 265.7 mph (427.6 km/h) over the course of 2 miles (3.2 km) during testing at United States Naval Air Station Lemoore in Lemoore, California. Hennessey used two VBOX 3i data logging systems to document the run and had VBOX officials on hand to certify the numbers. On February 14, 2014, on the Kennedy Space Center’s 3.22-mile (5.18 km) shuttle landing strip in Florida, the Hennessey team recorded a top speed of 270.49 mph (435.31 km/h) with Director of Miller Motorsport Park, Brian Smith, driving. As the run was in a single direction, and only 16 cars have been sold to date. The Super Sport version of the Veyron is recognised by Guinness World Records as the fastest street-legal production car in the world, with a top speed of 430.9 km/h (267.7 mph). 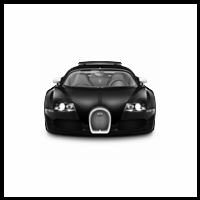 The Bugatti Veyron 16.4 Super Sport is a faster, more powerful version of the Bugatti Veyron 16.4. Production is limited to 30 units. The Super Sport has increased engine power of 1,200 PS (880 kW; 1,200 bhp), a torque of 1,500 N·m (1,100 lbf·ft), and a revised aerodynamic package. The Super Sport has a 431.072 km/h (267.856 mph) top speed, making it the fastest production road car on the market although it is electronically limited to 415 km/h (258 mph) to protect the tyres from disintegrating. The Bugatti Veyron 16.4 Super Sport World Record Edition is a version of the Bugatti Veyron 16.4 Super Sport. It is limited to five units. It has an orange body detailing, orange rims,and a special black exposed carbon body. It is not electrically limited to 415 km/h (258 mph) and will hit the record speed of 431.072 km/h (267.856 mph). The vehicle was unveiled in 2010 at The Quail, followed by the 2010 Monterey Historic Races at Laguna Seca, and the 2010 Pebble Beach Concours d'Elegance. The Super Sport is valued at GB£1.2 million. The 9ff GT9 was replaced by the GT9-R, offering up to 1,120 bhp (840 kW; 1,140 PS). It was designed to take the speed record for a street legal car, with a claimed speed of 420 km/h (260 mph). It does 0–100 km/h (62 mph) in 2.9s and 0–300 km/h (190 mph) under 16s. As with the original GT9, only a limited number of GT9-Rs were produced and only 20 with the largest engine. The GT9 is a supercar based on the historic Porsche 911. In fact, the looks and exterior styling of the car is also pretty similar to the 911, only with the interior of the car being stripped out for lightness and looks basic as compared to the Porsche. The car is faster than the original Bugatti Veyron, but slower than the SuperSport model. Regardless, the GT9-R is purely a beast on the roads and comes equipped with a rather unique technology. It is fitted and modified with a 4.0-Liter Flat 6 Engine which enables the vehicle to produce an impressive horsepower of 1,120 and torque of 910 lb-ft.This massive engine enables the vehicle to reach top speeds of 260 mph. The makers of the GT9-R have ensured no two vehicles manufactured are alike and offers potential owners with the option of customizing or personalizing their vehicles to their liking when it comes to design, color, and performance. The SSC Tuatara is an American sports car to be produced by SSC North America (formerly ShelbySuperCars Inc.) According to the manufacturer, the Tuatara will use an SSC designed billet aluminum twin-charged 6.9-Litre V8 engine block that will redline at 9,200 rpm and deliver a minimum of 1,350 hp (1,007 kW) and 1,280 lb·ft (1,735 N·m) at 6,800 rpm on 91 RON rated unleaded premium petrol. Its engine will be capable of higher outputs of 1,700 hp (1,268 kW). The car will weigh 2,750 pounds (1,250 kg) due to a carbon fibre construction (including the wheels) and aluminium crumple zones. This means it will manage a power-to-weight ratio of over 1,000 hp (746 kW) per tonne. The manufacturer claims the Tuatara will accelerate from a stop to 62 mph (100 km/h) in 2.3 seconds and the top speed is estimated to be 276 miles per hour (444 km/h). However It has a top speed of 256 mph. Nevertheless, with its beast of an engine the vehicle can easily hit 200 mph in under 16 seconds, which is quite reasonable for a car that is available for only €550,000. 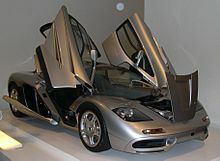 The McLaren F1 is a supercar designed and manufactured by McLaren Cars. Originally a concept conceived by Gordon Murray, he convinced Ron Dennis to back the project and engaged Peter Stevens to design the exterior and interior of the car. On 31 March 1998, it set the record for the world's fastest production car, reaching 231 mph (372 km/h) with the rev limiter enabled, and 242.8 mph (390.7 km/h) with the rev limiter removed. The Bugatti Veyron 16.4 beat it in 2005 with a top speed of 253.81 mph (408.47 km/h) according to Top Gear. The car features numerous proprietary designs and technologies; it is lighter and has a more streamlined structure than many modern sports cars. McLaren F1 still holds highest speed record as is naturally aspirated (Using no Supercharger or Turbocharger). It's Acceleration is 0-60 mph - 3.4 sec, Production 1992–1999 sold 106 cars. With its center driver’s seat, gold-line engage bay, and carbon-fiber body, it is also one of the coolest cars ever made. The Koenigsegg CCR is a mid-engined sports car manufactured by Koenigsegg. Debuting at the March 2004 Geneva Auto Show, the CCR is quite similar to the CC8S and like its predecessor it features dihedral synchro-helix actuation doors. It has, however. various improvements. An upgraded body with a larger front splitter for optimized downforce, tweaked headlight arrangement and revised rear end. New larger tires and wheels equipped with larger brakes. Upgraded suspension and a more powerful engine with twin Rotrex Superchargers, producing 817 PS (601 kW; 806 hp) at 6900 rpm and 920 N·m (680 lb·ft) of torque at 5700 rpm. At its debut, Koenigsegg claimed the CCR to be the fastest production car with a theoretical top speed of more than 395 km/h (245 mph). Said claim was put to test on February 28, 2005, at Italy's Nardò Ring where a team of five Koenigsegg engineers and mechanics together with founder Christian von Koenigsegg ran a standard CCR, driven by Loris Bicocchi to a top speed of 387.87 km/h (241.01 mph). Only 14 car were produced. The Pagani Huayra is an Italian mid-engined sports car produced by Pagani. Succeeding the company's previous offering, the Zonda, it costs €1,198,000 ($1,314,000), (£910,905). It is named after Huayra-tata, a Quechua wind god. The Huayra uses a twin-turbo, V12 engine developed by Mercedes-AMG specially for the Huayra. The Huayra's 6.0-litre engine, the M158, produces 730 metric horsepower (720 bhp (539 kW)) and 811 lb·ft (1,100 N·m) of torque. Its top speed is about 238 mph (383 km/h) and it has a rating 0–62 miles per hour (0–100 km/h) acceleration time of 3.0 seconds. Using Pirelli tires, the Pagani Huayra is capable of withstanding 1.66 g of lateral acceleration at speeds of up to 230 mph (370 km/h). The Pagani Huayra uses a seven-speed sequential gearbox and a single disc clutch. The company provides car enthusiasts and adrenaline junkies with top and high-quality cars which not only provide great speed, but also feature unique design cues. The Zenvo ST-1 is a high performance sports car. Its turbocharged and supercharged 6.8-litre V8 engine generates 1,104 hp (823 kW) at 6,900 rpm and 1,430 N·m (1,050 lb·ft) of torque at 4,500 rpm. According to The Motor Report, the car set a 0–100 km/h time of 3.0 seconds, with 0–200 km/h taking 8.9 seconds, and a top speed of 375 km/h (233 mph) The ST-1 is made entirely by hand with the exception of a high performance, 5 axis CNC router. The ST-1 comes equipped with keyless entry, satellite navigation, telescopic steering wheel adjustment and electrically adjustable leather racing seats. The car has a list price of €660,000. Has the ability to accelerate from zero to 60 mph in a mere 3 seconds. It comes equipped with a 6.8-Liter V8 Engine and generates an impressive horsepower of 1,104 and torque of 1,050 lb-ft, enabling the vehicle to reach 0 to 200 mph in only 8.9 seconds. Production is limited to 15 cars..